Fancy a Lavazza espresso machine in your car? You'd better order a Fiat 500L then. 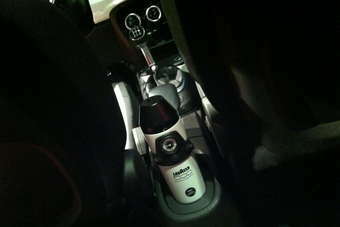 The system works on the same principal as your stove-top espresso maker: cold water in the lower chamber of a small flagon is heated when pressed into a slot between the front seats. When the water reaches boiling point it infuses the coffee above it, which is contained in pods. Your piping hot drink then awaits pouring from a chamber in the top of the flagon into branded Lavazza cups. The Serbian plant which will start making the 500L from late 2012 has been rebuilt with a capacity of 200,000 vehicles per annum so don't dismiss this euro 250 coffee maker option as a gimmick - this will be a tidy little earner. And just imagine the uptake from American customers when the car goes on sale there in 2013.